It’s really the pits when you pull up to the garage door at your home and it refuses to open. Fortunately, there are a number of options to remedy this problem. 1. There is a transmitter or handheld remote in your car and a receiver that accepts the signal from the remote and tells the drive system what to do. 2. There is a warning device that determines if anything is present within the path of the garage door that would prevent the garage door from closing properly. 3. There is a wired-in control button that allows you to operate the garage door from inside the garage. Determining which component of the garage door opener system is causing the problem is pretty straightforward. If the remote in your car won’t activate the opener but the hard-wired button on the garage wall operates the garage door opener properly, then the problem is contained within the radio transmitting portion of the garage door opener. If the remote in your other car (most systems come with 2 remotes) works the garage door opener, then the problem is within the remote that doesn’t work. If neither garage door opener remote will open the garage door, then the problem is most likely in the receiver that’s mounted on the garage door opener motor. First and foremost, you’ll want to check the batteries in your garage door opener remote. Nine times out of ten, that’s the reason that a garage door opener won’t open. Fortunately, that’s a really simple fix! There’s usually a 9-volt battery in the keypad itself, as well as a watch-type battery (or maybe a standard AA or AAA battery) in each of the handheld remotes for your garage door opener. Here’s how to replace the garage door opener keypad battery. Here’s how to replace the garage door opener remote batteries. Beyond testing and replacing batteries in your garage door opener remotes, there is little that you as a homeowner can do with the electronic transmit-and-receive portion of the garage door opener. Does this mean you must tear out the whole garage door opener and buy a new one? Absolutely not. If the problem is a bad remote control, you can purchase replacement garage door opener remotes online. If the receiver itself is bad, you can order a replacement garage door opener receiver, or a complete radio control system that includes a universal receiver and new remote control transmitters. Replacement obstruction warning shut off systems or safety sensors are also available online. These are of a universal fit, in most cases. Fortunately, parts for the most common brands of garage door openers are readily available on the Internet. 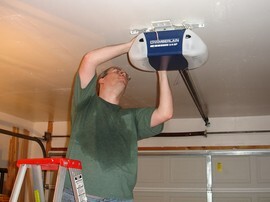 Keep this in mind if you happen to be in the market for a new garage door opener system. Sticking with a reliable name brand will assure that you will be able to get parts many years down the road. Repairing a garage door opener receiver is usually just a matter of removing a couple wires for the old one and attaching the wires for the new one. Programming a remote is simple. Older units will have a series of dip switches in both the remote and the receiver. All you have to do is make sure both units have all the switches in the same position. Modern garage door opener systems have a “learn” button which is used to match the 2 components together.